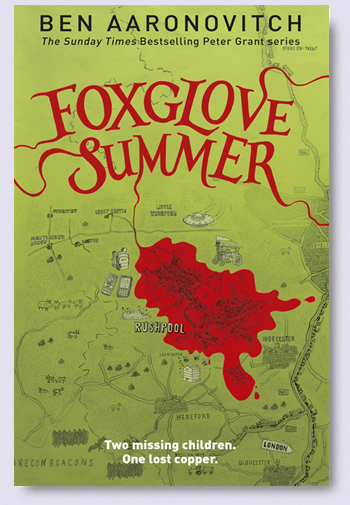 Foxglove Summer is the fifth installment of Ben Aaronovitch’s Rivers of London series. I know, I know, I’m not starting at the beginning. I wrote about the first book in this series a ways back on another site. I love the series and this book dovetails nicely with my previous post about diversity in media. First, let me give you an elevator pitch for the Rivers of London series. It is Harry Potter meets Law and Order with a splash of Tina Fey humor to lighten the mood. The main character is Peter Grant, a police constable in London who happens to be the first apprentice wizard on the force in sixty years. Foxglove Summer takes our intrepid constable and puts him into an environment that is outside of his comfort zone, the country. Two eleven year-old girls have went missing. The nation is abuzz with the search to find them and Peter’s boss, Detective Chief Inspector Nightingale, sends him off to lend a hand in the investigation. What should be a straight forward investigation of a missing person turns into a full-blown magical mystery with all the problems that this entails. Aaronovitch does an excellent job of pacing and characterization in this book. He sets up the reader with the expectation that the longer a search goes on that less likely that the outcome of the search is going to be positive. He then shows thew reader the unfolding mystery that is hiding behind this simple missing persons case that ratchets up the tension. He deftly uses humor throughout to keep the tension from becoming oppressive though pointing out the absurd aspects of the job of policing or being a wizard and a constable. We get learn more about Peter as he maneuvers an unfamiliar hierarchy in a setting that is not his cup of tea. The culmination of the mystery reveals a part of his character that I was hoping for and should have ripple effects in future books. The thing that is important to me about the series and this book in particular, is the diversity presented. Our main character, Peter Grant, is a multiracial character. He is also the child of an immigrant parent. Aaronivich doesn’t shy away from dealing with the discrimination that Peter has faced. In Foxglove Summer, there is a scene where it is apparent that there are those that bare him ill-will due to the color of his skin. The reader is given some insight what it must be like to face this type of behavior and the choices that one has to make. On top of this, this book presents the reader with a male constable that is helping Peter as having a boyfriend. It handles it as nonchalantly as discussing any other significant other. There is even a conversation between Peter and the constable about whether they were going to get married. It was so refreshing to find this character here and have him not be treated as a stereotype which is an all to frequent occurrence in urban fantasy. It felt good to see it being treated as normal. I love the Rivers of London series. The combination of magic and police procedural makes it fun and the characters and their diverse world make it awesome. Foxglove Summer is an excellent addition to the series and I can not wait for the next installment. I am a geek. I love TV shows, movies, board games, table top role playing games, video games, comics, and science fiction and fantasy stories. I am also a bear which, for those who may not know, means I am big hairy gay man. At minimum, these two things make diversity in media a very important topic for me. I’ve wanted to write about this for awhile but have avoided the topic. I occasionally bring it up in my local gaming group and it brings on groans of dismay at the least or statements such as, “Can’t you use your imagination?” This statement is both the reason that I have avoided writing about the subject but finally served as the impetus to actually do it. When the topic of diversity in media comes up, I often hear two arguments. The first is that there is no value in a diverse media. The second puts forth the idea that it is incumbent upon the population in question to create media for themselves. “Use your imagination.” This is the rallying cry of those that believe there is nothing of value in creating a diverse media. In the minds of those that espouse this argument, what is out there is good enough, and those of us that don’t fit the mold can just imagine a different protagonist to make a show or book more to our liking. This overlooks the most powerful aspect of a diverse media. It normalizes our communities. Every day, the media we consume presents us with a few stories. The audience sees these stories over and over and they become accepted as normal. Currently, the story lines that are presented show us a world where a hero saves the day. This hero is most likely to be straight, white, male, and rich. The diversity of the cast will be found in the victims and the villains. The idea of presenting a story where the hero is a female, gay, or a person of color is something that is rarely seen in the big franchises. The Avengers, one of my favorite movies, suffers from this. If you look at the line up, There is only one woman on the team, Black Widow. Her time on the screen pales in comparison to that of Thor, Captain America, or Iron Man. If we broaden our gaze, there is only one person of color to be found and then only as a support character, Nick Fury. What if these stories started showing us teams that were more balanced in terms of make up? What if a woman saved the day and rescued the man in distress? What if these types of stories were presented more often? Instead of having to be hailed as groundbreaking or ahead of their time, these stories would be normal. These characters would be just as accepted as Indiana Jones or Luke Skywalker. These diverse stories will not just make these things a normal occurrence, but will also become a form of outreach. There are many people out in the world that have limited exposure to those in some of these communities. They form their opinions, to varying extents, based on what they see in the media. If all they see are stories where people of color, the LGBT community, and others are presented as villains or victims, why should they think differently. The more these people are presented in a positive light, as the hero or leader, the more those out in the wider world with minimal exposure will begin to see them in that positive light. The idea that those not represented in media can just use their imaginations also overlooks the power of seeing yourself in it. I have several friends who are geeks who are parents. They have daughters. When you ask these girls who their favorite hero is, they say Batman, Captain America, or Spider-man. If you ask them about female heroes, the answer you will get is Wonder Woman. These little girls aren’t given many options and they do the best they can. One of them goes around dressed as Captain America with a tutu. So cute! But, what if she had a panoply of female heroes to choose from? What if she was shown stories that didn’t require her to co-opt the narrative to better suit her? Instead of making due, she could excel and love a story that showed her in it. “If you want diverse stories, you should go create them.” This is the other statement made in conversations about diverse media. It reflects a misunderstanding of how things work. Inherent in this statement is the idea that it is a simple thing for people of color, members of the LGBT community, women, and other minorities to get their voices heard. Just looking at the publishing side of science fiction and fantasy, it is easy to see that these voices are even more rare here than they are in the wider community. If one looks further, at things like awards and communities, a systematic bias against allowing these voices to be heard can be seen. This year’s Hugo nominations are a chilling reminder of this. This argument seems to ignore the fact that, for the most part, those asking for diverse media are minorities. This means there are fewer of us than there are of you. The math is just against us. Our communities are likely to have fewer writers, artists, show-runners than the community at large. We need those in the majority to tell stories about us. Imagine if Neil Gaiman wrote a story like American Gods where the protagonist was gay, a woman, or a person of color? What if Michael Bay made a Wonder Woman movie? This would take our stories from the sidelines and make them centers of attention. I love my games, movies, and TV shows. I don’t want less of the things I love. I just want more of the things I enjoy to actually care about me and others that are not represented. I want them to show us as heroes and champions. This way we have something to love that is us, and those out there can see us as the hero for once. One of my favorite books by Marvel is Moon Knight. They have taken a character I enjoyed in my youth and brought him back into the 616 with a vengeance. Footprints begins the tenure of a creative team which includes one of the powerhouse writers of the industry, Cullen Bunn. His current works include 6th Gun as well as various Deadpool books and creator owned titles. His team is filled out by Ron Ackins on pencils, Dan Brown on color, Travis Lanham on letters, and Tom Palmer, Walden Wong, and Victor Olazaba on Ink. With this new team, I was pleased to hear that they would be returning to the one shot stories with which Moon Knight began this new run. Unlike the those initial issues, these stories will share a thematic background that has been hinted at throughout both teams run on this book, the supernatural. Footprints opens with Marc Spector picking up the pieces from Khonshu’s horrendous attempt at taking another champion. Spector’s old headquarters were destroyed in this process and he is now ensconced in the a dilapidated hotel. The problem with this new hideout is that it has occupants that are quiet yet insistent. These residents are ghosts who are in need of a champion but unable to communicate in a normal fashion. Khonshu points out that, as his priest, Moon Knight needs to see to his followers and these ghosts are some of his followers. Bunn does an excellent job of picking up threads that have been laid down in the earlier issues of the books and interweaving them into his story. The dilapidated hotel from the kidnapping story is my favorite touch. The idea of Moon Knight as a priest is something that is well worth exploring. 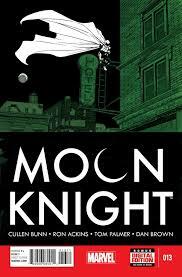 Combine this with a weird ghost hunter sort of vibe and Bunn has taken Moon Knight in a fun new direction that I am enjoying. Brown and Ackins take the stroy that Bunn has given them and creates a gritty looking cityscape that is reminiscent of the other artists on this title but unique. The use of reds through out to provide shading on things creates a feeling of dread despite the heroic nature of the story that is occurring. The action of the story is handled well and making Moon Knight appear brutal and relentless. There is a page towards the end of the story where Moon Knight is standing, surrounded by ghosts. The red tinting is brought out in stark relief by the ghosts. It is a beautiful page that goes a long way to illustrate what it takes to protect those that can not protect themselves. I am excited to see what Cullen Bunn brings into the Moon Knight universe. A supernatural angle is something I have always wanted to see in Moon Knight. I am looking forward to seeing how this theme plays out under Bunn’s deft guidance. I can not wait for issue 14! With the death of Paul Walker, the fate of Furious 7 as up in the air. The studio decided to move forward with the movie and added in a CGI version of walker into the scenes that were remaining to be show as well as to the new ending that was created as a memorial to Walker. The Fast and Furious franchise is one of my guilty pleasures. I love the over the top chase scenes and the added benefit of Vin Diesel, Jason Statham, and Dwayne Johnson in this latest outing ensured that I was going to see this movie. Going in, I knew that I was not the target demographic for this movie. The amount of scantily clad beautiful women placed throughout the movie further reinforced this idea. The audience is only given a shirtless Dwayne Johnson for a few minutes, for which I am still grateful. The opening scene of the movie sets the tone for the rest of the story. This scene shows Deckard Shaw, played by Statham, on the phone attempting to discover who put his brother in the hospital. The camera pans out to show a regular private hospital room. As Deckard finishes his call, the audience is shown a cowering doctor and nurse. Deckard orders them to take good care of his brother. The scene as he walks out of the hospital is utter carnage. There are dead heavily armored police littered on his path out of the hospital and collateral damage to the building and staff is monumental. Deckard exit from the hospital is topped off with one final explosion erupting from it. I don’t expect logic to play much into a Fast and Furious story line but this scene alone tells you that logic is on vacation and whoever is at the wheel is drunk on tequila and ready to party. I was reading some of the pre-release press on the movie and saw a piece where it was compared to the Magnificent Seven. I can see the bits where the comparison can be made but the wild west feeling is never something that comes out throughout the movie. In the end, the movies feels very much like a Shadowrun adventure. Deckard, the big bad of the piece, breaks into a supposedly secure governmental agency to retrieve the information on who hurt his brother. In the process, he puts Hobbs, played by Dwayne Johnson, into the hospital. Thus begins the game of cat and mouse between Deckard and Dominick. The Shadowrun nature of the movie crops up as Dominick’s crew discover that Deckard is a black ops agent and they will need governmental help in tracking him down. To get this help, They have to pull off an extraction of a capture hacker in order to use her program to find Deckard. And like any good Shadowrun adventure, the end goal is never that easy and a trip to another exotic location is needed. The chase scenes are over-the-top and the action is scenery crunching throughout. The dialogue never really rises beyond a that of a Shadowrun Adventure though. If it were clever and quick-witted, a comparison to Leverage could have been made. The thing that was a bit weird for me were the scenes of Paul Walker that were CGI. These scenes enter into the uncanny valley and trigger my hind brain “something is not right here” vibe. The final scene which is more a memorial to Paul Walker also feels off as it doesn’t fit into the story that has been presented. It feels welded on and could have been handled a bit more delicately. 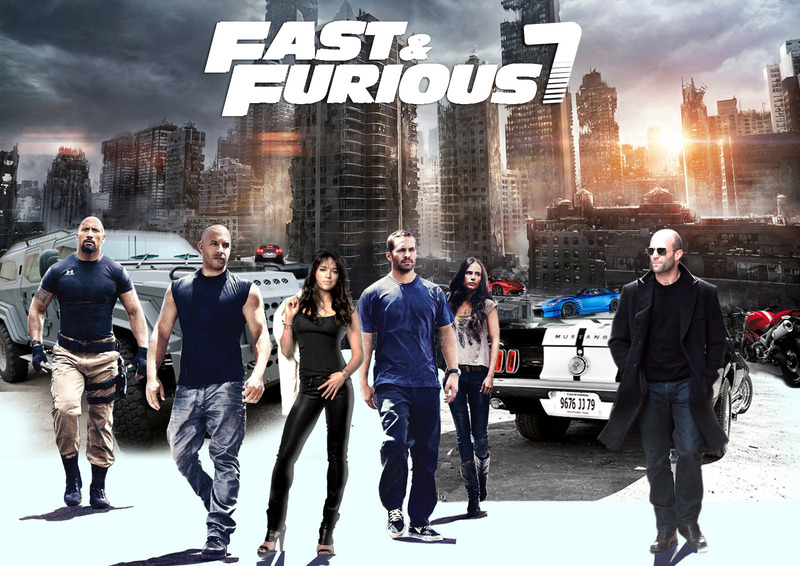 Overall, Furious 7 is a good addition to the Franchise. If you have enjoyed any of the last three Fast and furious movies, I highly recommend seeing this in the theater.